The Sun: Living With our Star is the biggest exhibition about the sun ever to be staged. 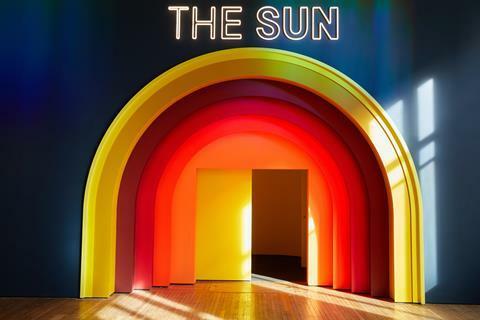 Featuring displays, historical artefacts and interactive experiences to explore how our relationship with our closest star has changed over time, the Science Museum has ensured the sun can be appreciated even on a rainy day. The exhibition is divided into four sections. The first focuses on the sun’s early role in timekeeping. Early civilisations were fascinated with the sun’s movements across the sky, and before mechanical clocks were invented these movements offered the only way of tracking days and years. Further on, the sun’s role in healthcare is explored. We now know that UV exposure is linked to skin cancer, but in the late 19th and early 20th centuries sunbathing was encouraged as a healthy activity. UV light was known to kill bacteria and clinics that used sunlight or artificial UV sources as treatments for tuberculosis and other ailments were common. In this section, medical artefacts such as an electronic ‘light bath’ used by doctor and cereal magnate John Harvey Kellogg surround an indoor beach that visitors are encouraged to enjoy, complete with metallic palm tree sculptures, deck chairs and sound effects. The next part of the exhibition is dedicated to harnessing energy from the sun. It takes us through the history of solar power, from early solar collectors and sun-powered motors, to contemporary solar panels and the ongoing quest to create an artificial sun on Earth that uses nuclear fusion to generate electricity. The fourth section is dedicated to observing the sun, and the highlight for me was the very last thing we are shown: a darkened room filled with stunning high-resolution time lapse images of the sun’s surface. The movies were taken by Nasa’s Solar Dynamics Observatory spacecraft nearly 36,000km above the Earth, and capture the dynamic, sometimes violent, reactions on the surface of the sun using different wavelengths of light. The sight is mesmerising, and I could have stayed and watched for hours. The entire exhibition is a really good mix of history and contemporary science. There are some great artefacts on display, including the original orrery, a mechanical model made in 1712 to demonstrate the movement of Earth around the sun, and a ST25-HTS tokamak, the first prototype nuclear fusion reactor. Suitable for all ages, it’s a great way to spend an hour or so in the Science Museum and worth catching while it is still on.